When I got back to my vehicle last night a voice from the river startled me pretty good by asking how the fishing was. After I got over having the crap scared out of me, I and the other flyfisherman exchanged reports for the day. This morning as I was about to hike down the river to Rondowa the same guy and his fishing partner headed down the river. So I had some company for the hour or so walk down the river to Rondowa this morning. It turns out Bart is from Alabama while his fishing buddy lives in Colorodo (although he is from Baker City originally). When we arrived at Rondowa there were 4 people fishing the run already. As we stood there discussing options for fishing, the group of people moved down the river to the next hole. I told Bart and Collin that I would join them at the big run long enough to watch them catch a fish or two, but then I was fishing up the Wallowa River. I watched a little while and was surprised that there were no fish caught since I had caught three steelhead here the morning before. I drifted my flies through as well just to be sure it wasn’t there flies or setup, but I did not do any better. “Perhaps the fish have been fished over pretty hard already,” I suggested, “and they just need a bit of a rest.” Bart and Collin joined me for a short time on the Wallowa before I headed upstream and they headed back down. I got on the railroad tracks and walked up stream until I found an exceptional looking spot. There was a big pool not too far up from the confluence that looked as though it should hold some steelhead. I worked the water thoroughly and about half ways up the pool I hooked and landed a hatchery buck on my flashback stonefly. I sure like that stonefly pattern. Soon after that I had a second steelhead on, but he decided he wanted to head downstream. I had walked along a rock ledge that was at the edge of a small rock bluff and I didn’t think I could make it downstream very quickly so I tried to turn the fish. And that was the end of that. Soon after I heard voices above my head and it sounded like someone was at the edge of the rock bluff above me getting ready to cast. I waded upstream into view and made enough noise so that they noticed me. I wasn’t really done fishing the pool, but I moved upstream and let them have it since I had already got two fish hooked out of that pool. Around the next bend there was a pretty nice looking section of water that was not really a pool and not really a run. It had some depth to it and it was more like deep riffles on the corner. Either way it looked fishy to me. I again fished it pretty methodically and finally hooked a steelhead. The steelhead first started to swim away from me, but then headed straight towards me faster than I could pull line in. It was too late, the fish put a bunch of slack in the line and got off. I got back on the tracks and walked upstream to Kimmel. 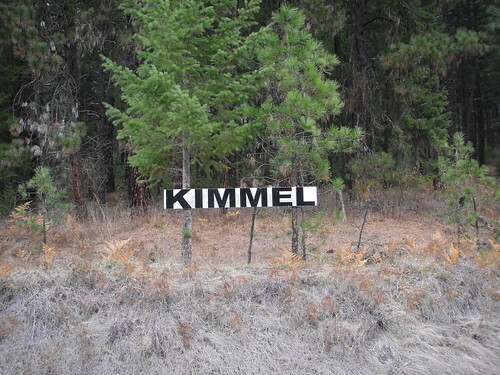 I am not sure what Kimmel is or was. All there is now is a railroad crossing that goes nowhere and a sign that says Kimmel. I had passed several good looking sections of water, but I thought I would just work them on my way downstream. I fished several runs thoroughly that I was sure I would catch a fish out of, but didn’t. Perhaps there just aren’t that many steelhead up the Wallowa yet. 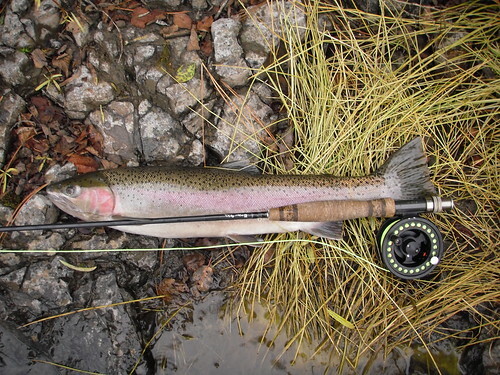 When I came to the head of a really long pool I hooked another steelhead. This one came out of the water several times and it looked as though it had my olive woolly bugger. I finally got it right to shore, at my feet when the hook pulled free and the steelhead swam away. I began walking the 5-6 miles back to my vehicle at this point. I stopped at Rondowa again and quickly drifted my flies through. Nothing, so I moved on upstream. I stopped a few places on the Grande Ronde on my way back to Palmer Juction, but didn’t catch anything. Rondowa is looking even less magical today with only one landed out of four steelhead hooked. But it is still better than my one fish hooked on the John Day Monday. I got back to camp when it was about dark. Bart and Collin were camped just upstream of me so after getting out of my waders I headed over to their camp to see if there day went any better. As I approached I asked, “How was the catching?” There was no reply for a minute and then Collin said, “You mean how was the fishing.” It seems that they had nothing on all day. The four people who fished the big run before them moved to the next hole downriver and camped out there all day. To say the least Bart and Collin sounded a little down. They had traveled a long way to catch steelhead and hadn’t connected with any yet. I convinced them to try the Imnaha. 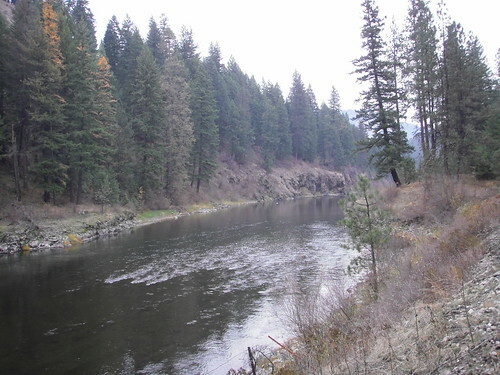 It will be less crowded than the Grande Ronde and I believe it is more enjoyable to fish as well. With how crowded the Grande Ronde is, if one or two spots on the river are taken in front of you, you may have to walk several miles before finding another decent looking section of water to fish. I hope they had a better day fishing the Imnaha. After talking steelhead, we exchanged lots of stories about fishing, floating, and exploring around their campfire. It seems Collin is quite the float addict. It sounds like he has floated the Grande Ronde so many times he could almost do it in the dark. Bart had some good fish stories to tell and I was able to glean some good camera information off of him as well. He got me a little lost with some of the camera jargon, but I suppose that can happen when someone gets into any subject you don’t know a lot about. I have fished the Grande Ronde religiously for the past several years since making this post. We are now offering guided trips on the Wallowa and Grande Ronde River, please visit our guided trips page for more information. This entry was posted in Steelhead Marathon 2010, Wallowa River. Bookmark the permalink.